While working at Booz Digital, I was inspired by the deep knowledge and wisdom present in the team, and saw an opportunity to leverage our team’s unique strengths and capabilities to add a greater value and increase social impact throughout our work. This project was part of a larger Social Impact Initiative to leverage our digital innovation and strategy expertise to amplify existing social impact projects by delivering pro-bono services to non-profit organizations or social projects. One of our clients was UCP Wheels, a non-profit that has been working for many years to bring mobility to thousands all over the world. UCP Wheels has been doing this work for a long time; however, we saw an opportunity to increase the impact and reach of their work by creating a more refined brand messaging and communications strategy, and by increasing the level of engagement with an existing base of supporters. 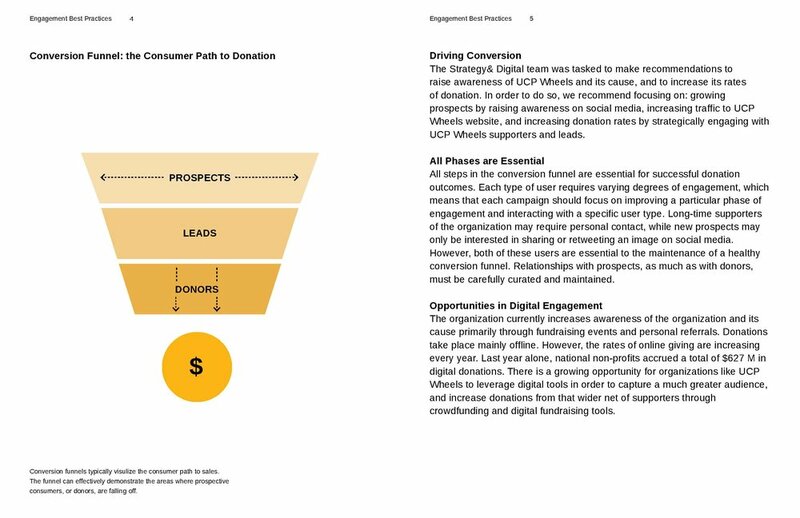 How to create a robust digital engagement strategy for UCP Wheels? and how to redefine the brand voice and messaging so it feels more inspiring? Facilitated workshops with the leadership team to align on non-profit’s vision, mission, and values. Created a series of exercises for the team to align their vision with the organization’s mission, as well as to refine the communication strategy behind the non-profit’s work. As a result, we created a brand vision that felt aligned for the entire team, and this new vision informed the brand-re-design, as well as the engagement recommendations. Created Brand and Engagement Recommendations for the team. We also delivered high fidelity design assets for the website re-design, which were incorporated into the new website buildout. Formed a guerrilla team of designers, strategists, and technologists (inside Booz Digital) to provide pro-bono services to UCP Wheels for Humanity, a non-profit dedicated to bring mobility to thousands of people worldwide. The project itself entailed a transformation in the branding and design strategy of the organization. School Library of the Future.